There’s always a lot happening in Oriental! We may be the Sailing Capital of North Carolina but we’re also much more than that. Here are some of the regular events going on in and around Oriental, North Carolina in the next few weeks. Open Mic Night – every Wednesday night at The Silos. Besides being known for their annual outdoor music Fest “SilosPalooza,” The Silos opens up their indoor stage every Wednesday for anyone wanting to jam for a while. Stop by for a great pizza or some seafood and kick back while you enjoy the music. Neuse River Winery Wine Tastings – the winery is open every Thursday, Friday and Saturday for wine tastings and a tour of the facility. Hosts Glenn and Rolayne Schwendy explain the passion and dedication necessary for growing exceptional grapes and turning their product into delicious wines. Oriental History Museum – stop by the history museum any weekend to get a glimpse into Oriental’s history. How did we get our name anyway? Take one of the complimentary walking tour maps and stroll through the village to get a taste of our unique history. Friday Flicks at The Old Theater – in between regularly scheduled musical performances by top line musicians, the Old Theater hosts Friday Flicks. For $5.00 you can watch a classic movie and enjoy free popcorn. Inland Waterway – stop by to check out the gallery’s current guest artist. Each month the Inland Waterway Gallery hosts different North Carolina artists as well as showcasing some of the finest works of our local craftsmen and artists. Nautical Wheelers Wine Tasting – the third Saturday of every month, you can sample some of the finest wines and excellent deals available. Wine Tastings are held on the front porch of this delightful shop. 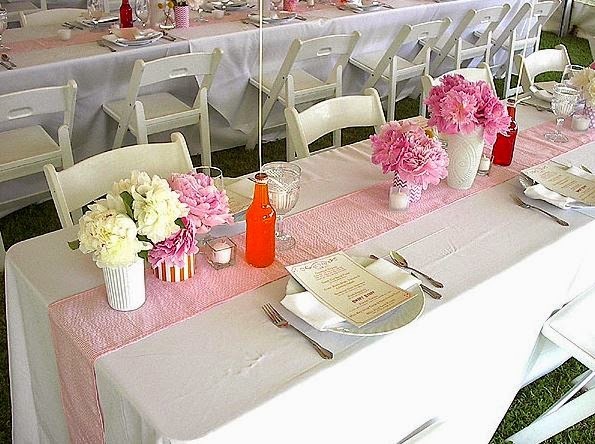 Oriental also hosts an unusually large number of special events for such a small village. We host multiple festivals and boating events as well as art shows, musical events and theatrical offerings. come visit us in Oriental – we know you’ll have a fabulous time! Wow, there’s always something cool happenin’ in and around Oriental! Pamlico Community College will host its Second Annual Bluegrass Festival – next Saturday, March 7th from 11 a.m. to 4 p.m.
Come on out and listen to some great music, get up and stomp out a few clogging steps and have a good old fashioned time all day. We’ve got rooms available with great views of the mighty Neuse River (4 miles across at our location), great mattresses for a good night’s sleep and the restaurants are all a short walk away from our hotel. Music for the day will be provided by Dennis Cash, Harbor Sounds, Marvin Walker, Thursday Morn, Downeast Dulcimers, Gumbo Lily, The Wilson Family, Three Rivers Band and Jazzomine. The best part of all? Admission is FREE! No charge for a day full of good music and good fun. There will also be a raffle for an acoustic guitar. 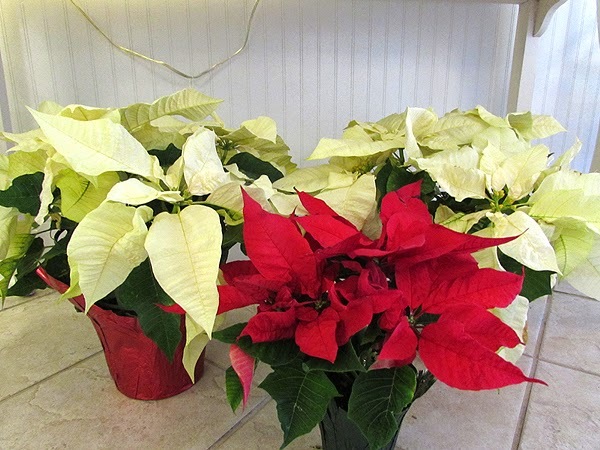 You’ll find PCC on Hwy 306 South, a short fifteen minute drive away from River Neuse Suites. Y’all come on down now, hear? Yes, it’s cold . . . really cold. But we can look at the photo and dream, right? It may be cold and icy with blustery winds today, but winter doesn’t last long in Oriental, North Carolina. 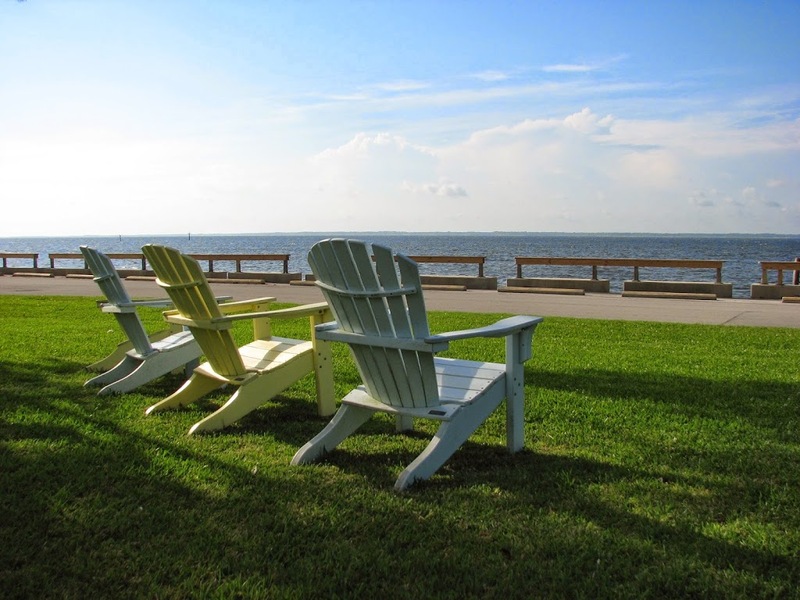 We should see some warm temps in the next few weeks – maybe even into the 70’s – and that’s just right for lazing away by the water in one of our comfy Adirondack chairs while the sun warms you. Come for a visit – we’ll hold a room for you! 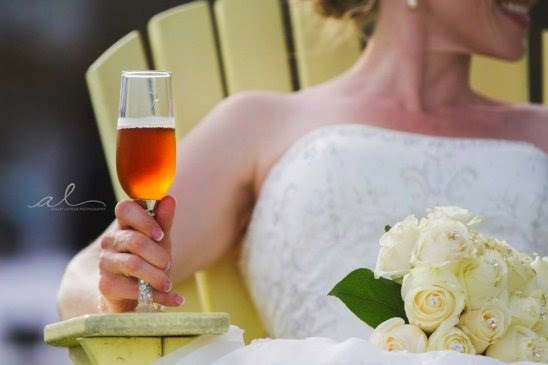 We’re getting close to Valentine’s Day and that means brides-to-be will start planning their weddings all over the state. 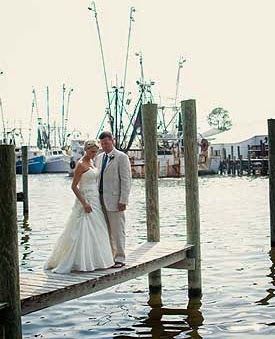 River Neuse Suites offers a free North Carolina Waterfront Wedding Venue here at our lovely waterfront hotel in Oriental, North Carolina. 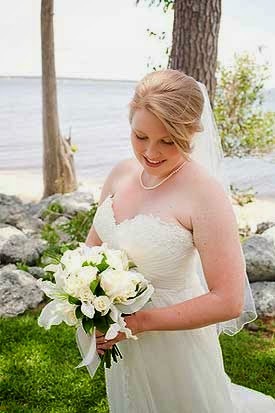 Over the next few weeks, we’ll feature some of our previous brides along with their entourage. 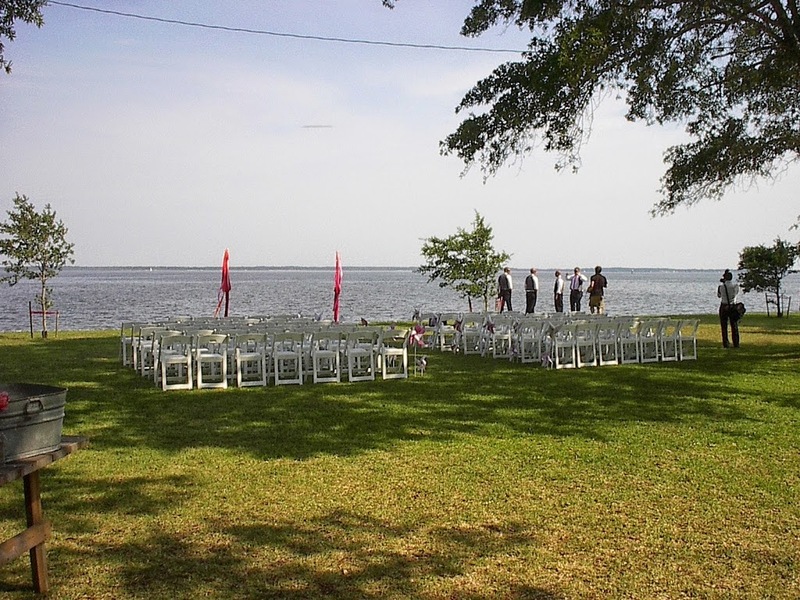 Oriental, NC is a charming village and the perfect venue for your wedding. Folks are friendly and the pace is laid back (although there’s plenty to do if you choose). 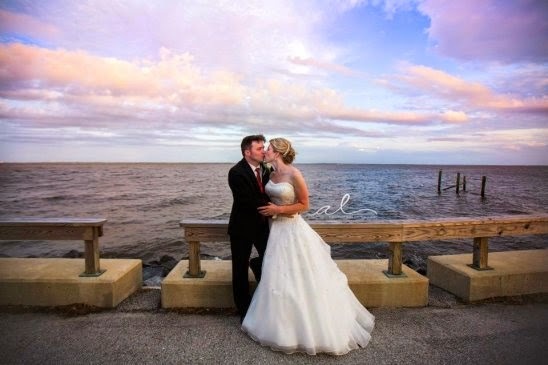 Give us a call or come visit – you’ll fall in love with Oriental, NC! 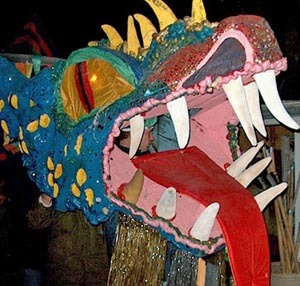 A grand time was had by all at last night’s annual “Running of the Dragon.” Our mighty resident Chinese Dragon came out of her lair, as she does every year, to greet residents and visitors alike. Accompanied by kazoos and the “Drummin’ Dragons” drum group, our intrepid dragon roars her way up and down the village streets while everyone follows along. Folks beat on pots and pans with wooden spoons to ward off any lurking evil spirits and they even occasionally jump underneath to help propel the mighty creature. To ensure good fortune in the coming year, it is imperative that you touch a dragon fang. The annual dragon run is great good fun for young and old alike. There are two runs every New Year’s Eve – one at 8:00 so the younger kids can take part and one at 11:30. Plan to stay with us next New Year’s Eve and celebrate with us! Thank you to everyone who stopped by our Annual Spirit of Christmas Open House during this charming two day festival of cheer! We enjoyed all of the regular guests as well as several new visitors who toured the suites while munching on goodies provided by The Sweet Tooth Fairy. Several regulars asked where the famous Seafood Chowder (prepared each year by owner Shirley Garner) was but, alas, Shirley and Ted were not in town this year to serve up her famous chowder. Hopefully, next year the chowder will be back since Shirley has quite a reputation as a gourmet cook! The hotel was beautifully lit with crabpot Christmas trees on the front lawn and massive wreaths on the building. We were bedecked with garland and holiday finery, a good time was had by all, and everyone who toured our hotel here in Oriental, NC loved the rooms and suites and thought everything was absolutely lovely! 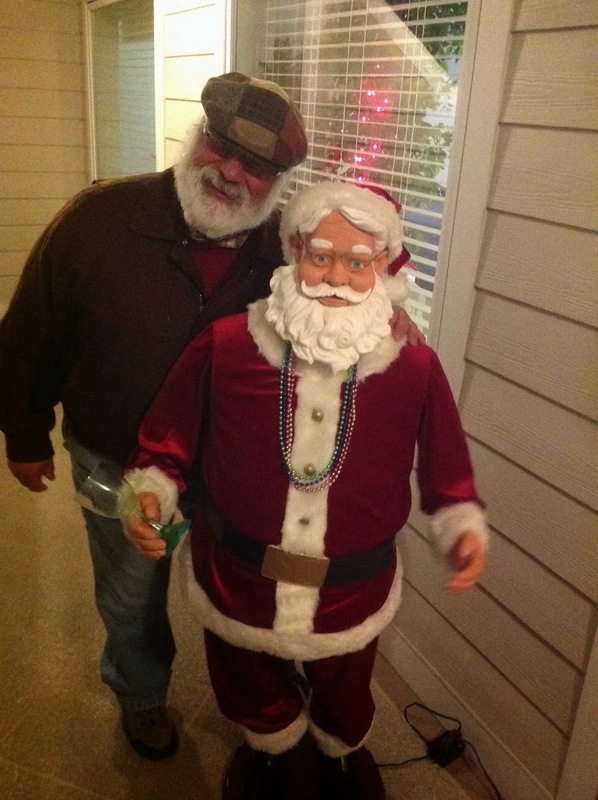 Wonder if Santa (either or both of them) will be here this year for our Annual Spirit of Christmas Festival? Stop by our hotel here in Oriental, NC to find out! 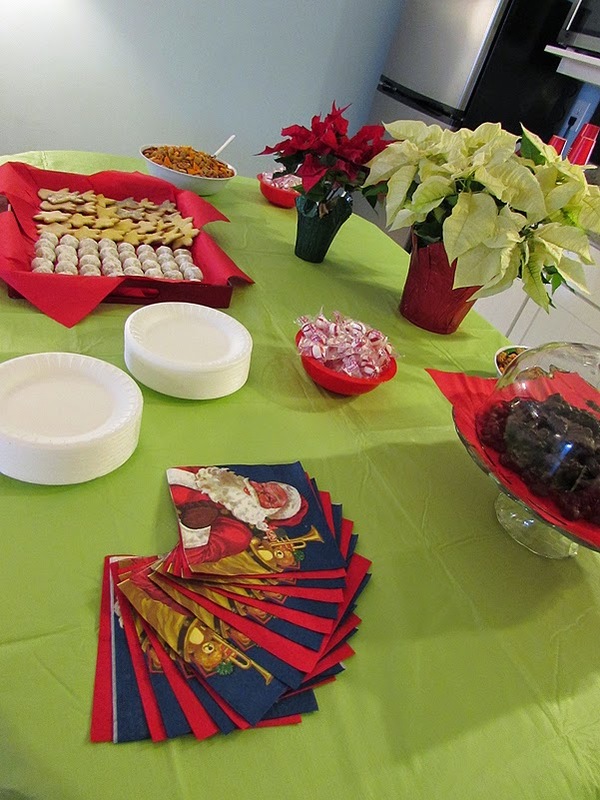 Even if Santa doesn’t make it, some of his ‘elves’ will be busy serving up gourmet cookies from The Sweet Tooth Fairy along with other goodies and hot coffee during our Holiday Open House on Friday, December 12th from 5 p.m. to 7 p.m.
We’re all looking forward to this year’s Spirit of Christmas. If you’ve never been to Oriental, North Carolina, then this is the weekend to come visit. Oriental puts her best foot forward with an incredible two day event that showcases the warmth and open friendliness you’ll find in our quirky little village. Merchants open their doors to serve a fabulous array of delectable goodies – from chowders and soups, to cookies and roasted chestnuts – you can easily “graze” your way through town. There are more musical performances than you can get to in a single evening as well as caroling in the park. There’s the Annual Spirit of Christmas Parade which is always guaranteed to be an absolute hoot and the lighted flotilla is lovely. A charming live nativity features local little ones. Then, in the early evening, just at dusk as the town falls silent, many helping hands light over 3,000 luminaries that line the village streets and the river walk. It’s breathtakingly beautiful. We still have rooms available for your choice of one or two nights and we are centrally located so all the festivities are right out your door. Come join us this Spirit of Christmas – we’ll save you a cookie or two!